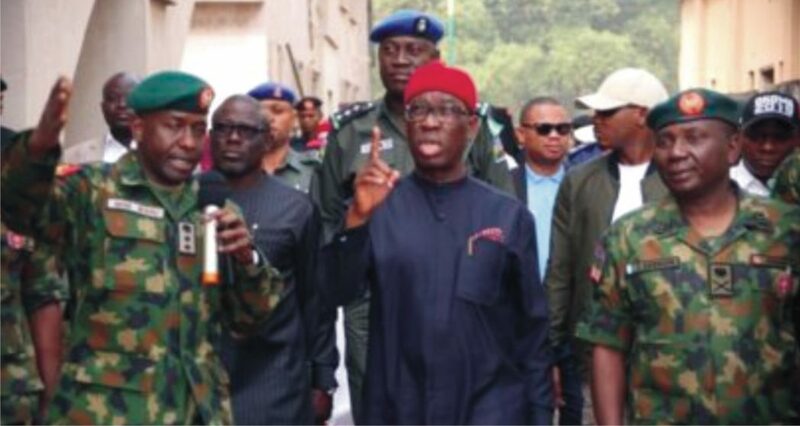 Delta State Governor, Senator Ifeanyi Okowa (middle), with General Officer Commanding 6 Division Nigerian Army and representative of the Chief of Army Staff, Major General Jamin Sarham (right), Speaker of the State House of Assembly, Rt Hon Sheriff Oborevwori (2nd left), Acting Commander, 62 Brigade, M.H.B. Mamu (left) and others, during the inauguration of the 63 Brigade of the Nigerian Army in Asasba, yesterday. The Chief of Army Staff, Tukur Buratai, a Lieutenant General, yesterday inaugurated the 63 Brigade of Nigerian Army and flaged-off Operation Egwu Eke (Python Dance) in Asaba, Delta State. Mr Buratai, represented by Jamil Sarham, a Major General and General Officer Commanding (GOC), 6 Division, said the brigade would ensure peace, security and promote commerce in Asaba and its environs. 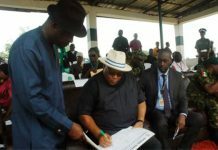 He said the essence was to checkmate the myriad of security challenges in the country. He said the establishment of military formations required huge financial commitment, adding that while the various governments made provisions, other stakeholders would be required to support the project to ensure adequate security. Mr Buratai assured all law abiding people of the state that the Army would ensure adequate security and safety even as the nation approaches the 2019 general elections. He said the Army would work in cooperation with other security agencies to ensure peace in the state. The army chief said at the end of the python dance exercise,” the python must have swallowed all the hoodlums, bandits, kidnappers and militants among others in the country. 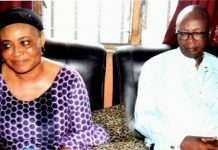 “The python will also address the issues of fake news by unpatriotic elements; it is necessary that we draw the attention of all well-meaning Nigerians that they must have at the back of their minds the importance of national security,” he said.